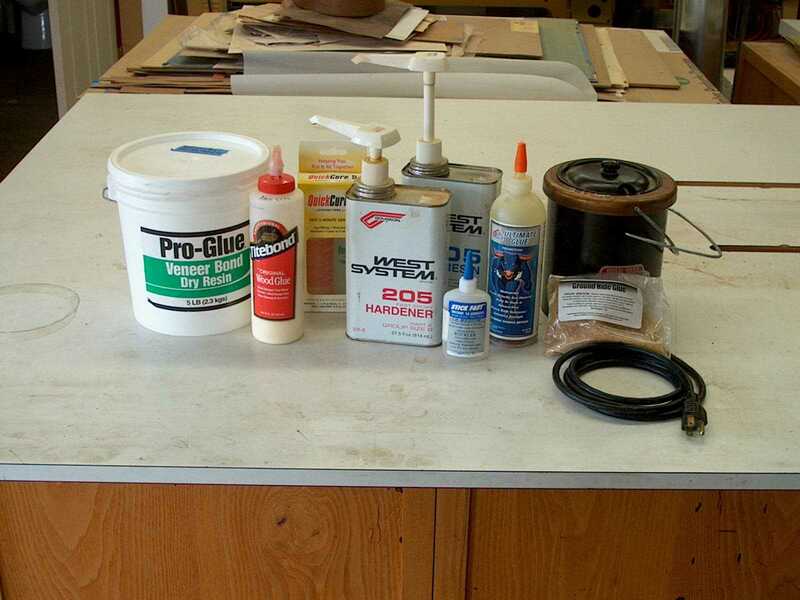 There are a number of common adhesives for woodworkers. The two I use most often are plastic resin for veneering and hot hide glue for solid wood. Occasionally I will use yellow glue for special situations, epoxy tinted with fresco powders to fill small defects, and expect to use cyanoacrylate as I explore wood turning. 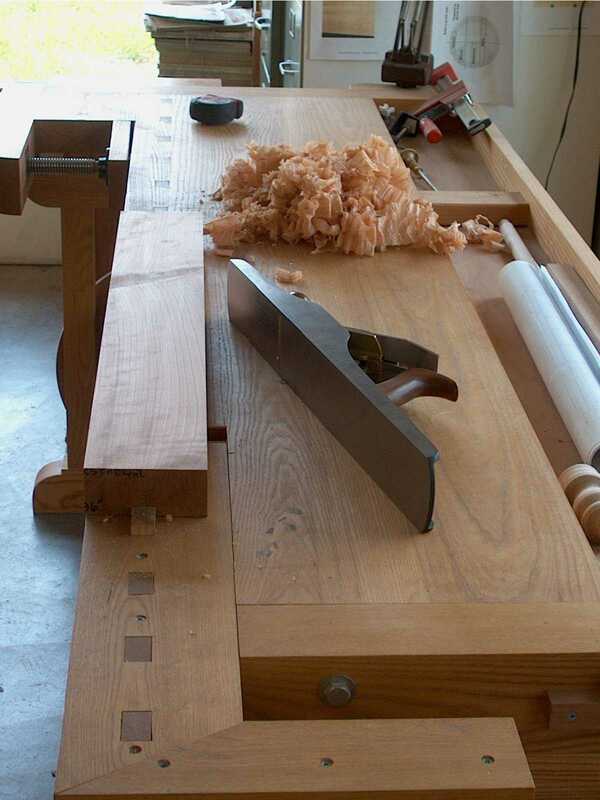 There are several key fundamentals for strong glue joints. When these are not followed, joints are much more likely to fail. First, all adhesives must be used as intended by the manufacturer. As examples, yellow glues skin over quickly, so joints must be assembled and clamped quickly; plastic resin glues need a minimum temperture of 70 degrees F to cure. Second, glues need to be thoroughly brushed onto mating surfaces. Applying a bead of glue to the end of a tenon and assembling the joint is very fast, but the adhesive bond is minimal. Thoroughly brushing glue onto the sides of a mortise and inserting a dry tenon is an improvement, but still risks premature joint failure. Excess glue squeezeout can create dreaded “glue stains” that interfere with staining, but is not caused by brushing glue on all surfaces. It is caused by applying too much glue. Third, joints have to be well made. 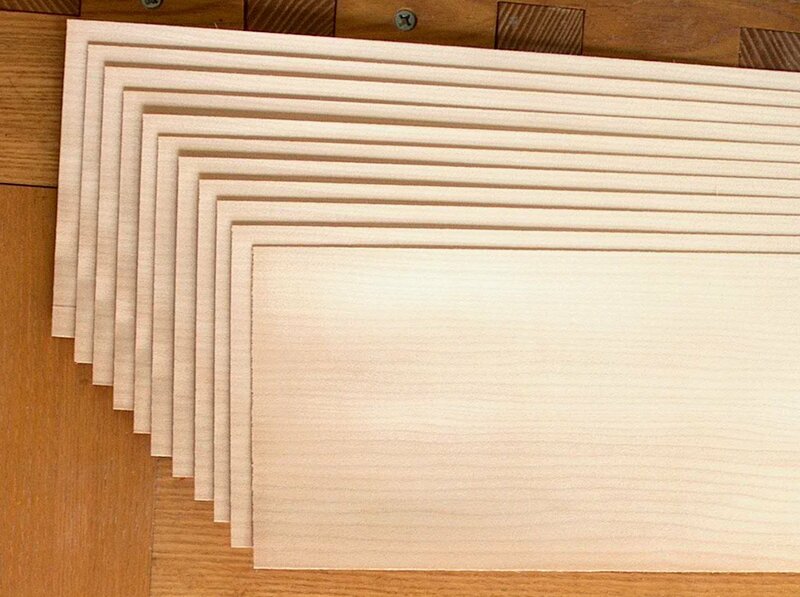 When edge gluing two boards, those edges need to be flat and straight over their entire lengths. 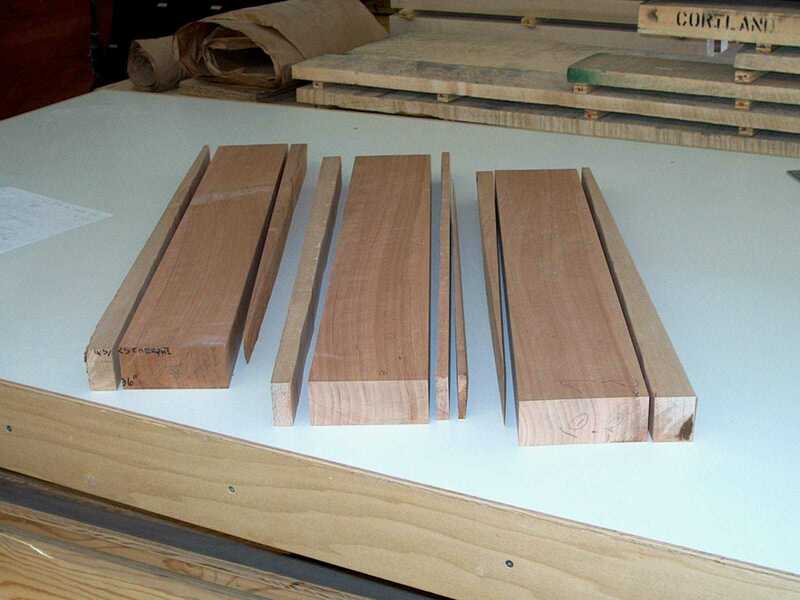 Mortise and tenon and dovetail joints should be a “friction fit” meaning slight pressure is needed to assembly and disassemble the dry joints. Fourth, adequate clamping pressure has to be applied in a timely fashion until the adhesive cures. When a joint fails prematurely, take a look at the mating surfaces to see if the joint was well made and the mating surfaces show dried glue over the majority of their meeting surfaces. Do not simply apply more glue and re-assemble without first properly preparing the joint. Trees grow using annual growth rings, the coincentric circles seen in the end of a log or the top of a stump. When a log is sawn into lumber, the faces and edges of a board intersect those growth rings. The resulting patterns that appear on the faces and edges I call “grain patterns” and there are two basic types. This provincial style table top has five boards. The darker middle of each demonstrates “ovals and arches,” the most common type of grain pattern. 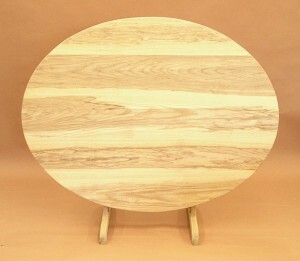 Some people prefer this grain pattern feeling it is more active and more natural. When the grain pattern is fairly consistent across the boards, and somewhat centered in each, the result can have balance and appeal. 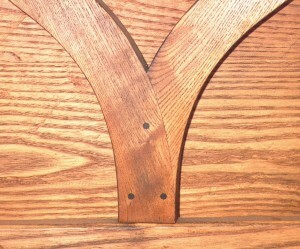 When the ovals and arches run off the edges of some of the boards, the result can be irritating. This table found in a consignment shop is not very attractive. The other basic type of grain pattern is “quartered and rift” resulting in fairly uniform parallel lines. 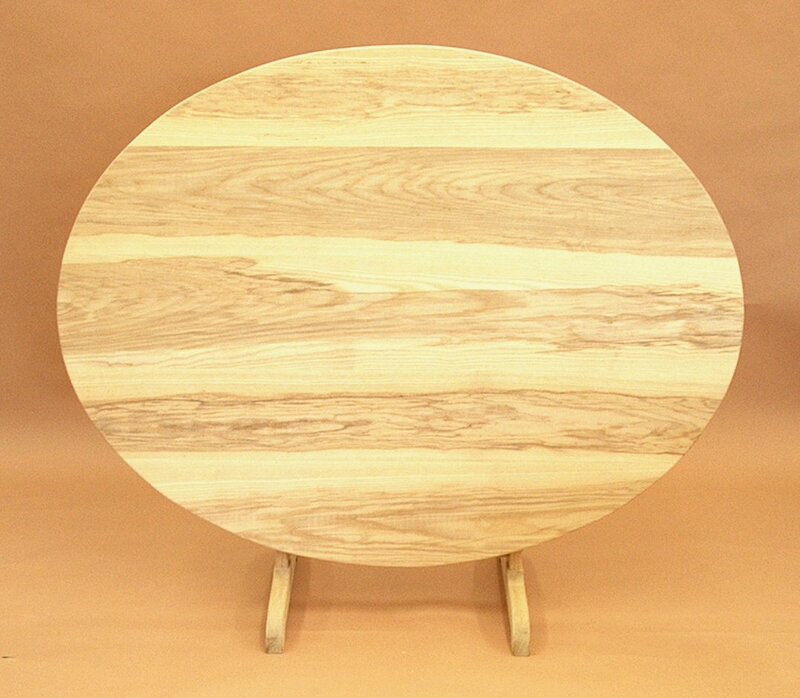 One of the boards in the above consignment table top shows a quartered and rift grain pattern. 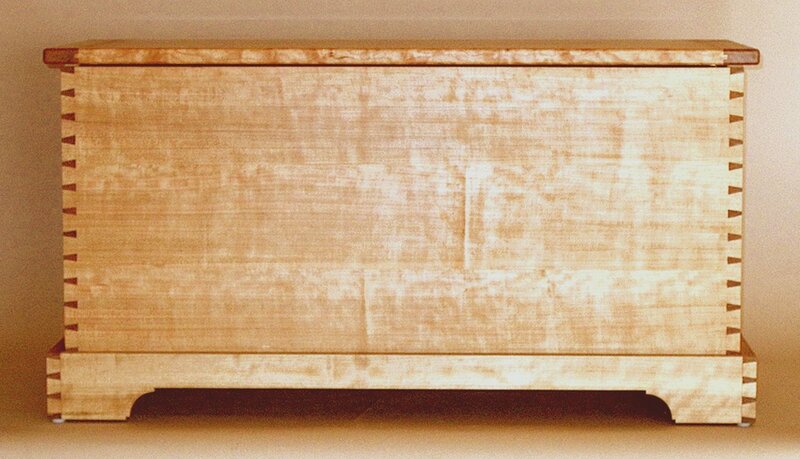 This blanket chest front shows three boards, each quartered and rift. The “quieter” grain pattern allows the eye to focus on the overall front and dovetails, rather than the individual boards making up the front of the chest. 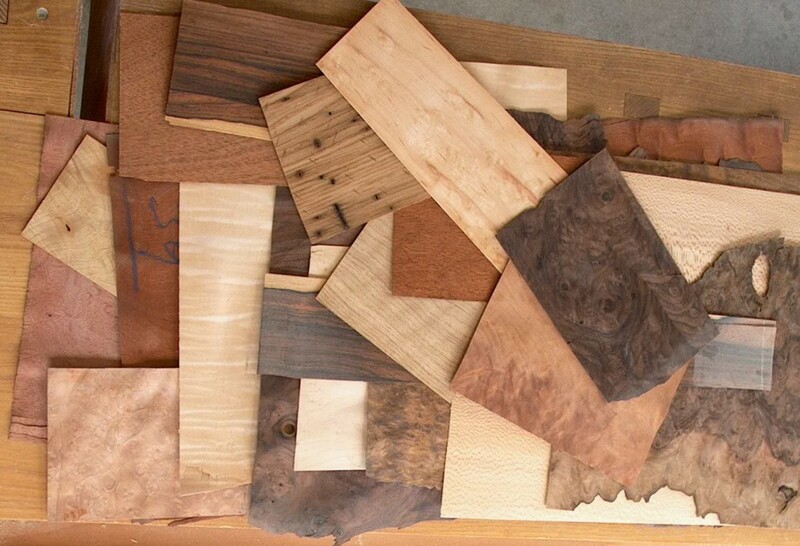 I keep a collection of example grain patterns in my workshop to examine and discuss with interested visitors. In addition, a more detailed description can be found on my website at www.stephanwoodworking.com/CommonBoardGrainPatterns.htm. Imagine giving to a new daughter-in-law on her anniversary the next size of your set of handcrafted Shaker nesting oval boxes. The annual exchange symbolizes the ever growing bonds between the families. The partial nest in each household is a constant reminder of what is evolving. And the practice can become a treasured family tradition to repeat with the next generation. The Shakers are legendary for their sense of honor, commitment and craftsmanship. A Shaker reproduction shows the recipient how much you love, respect and cherish them. 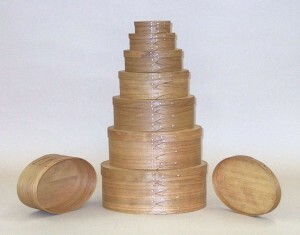 Handcrafted Shaker oval boxes show subtle variation in the trimming of the fingers and placement of the tacks and pegs. 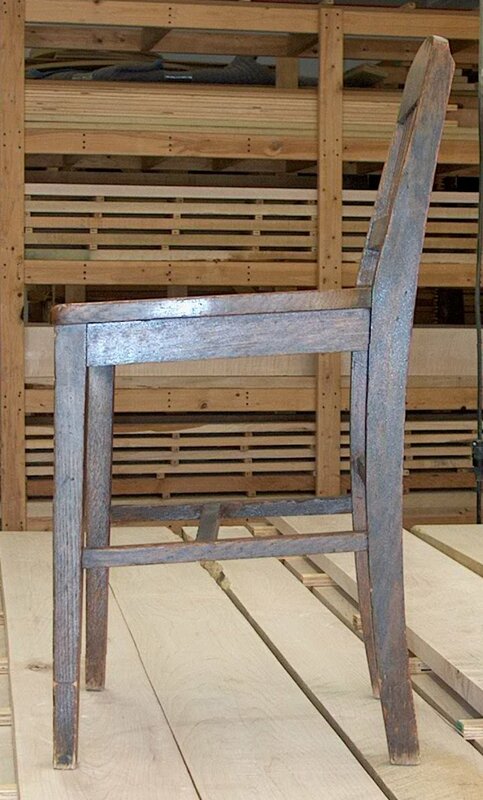 In respect to the Shakers, there should not be any glue or filler used – craftsmanship is all. The boxes will not have machine-like regularity, but neither do memories and traditions. Many of today’s commercially sprayed finishes are very durable, but that comes with a price. Especially when built up into a thick film, those finishes are subject to chipping. And if color was applied within the spraying sequence (toning and glazing) those chips will be not only low spots but also lighter color spots, making them more noticeable. Invisible repairs are almost impossible, according to a long-time commercial finisher/refinisher. Stripping these modern sprayed finishes is difficult (i.e. expensive) because they are so hard. So the most common “solution” is to throw the chipped furniture away and buy new. But if the replacement has a similar finish . . .
Renewable finishes are an alternative. Whether brushed, padded or sprayed, shellac is a film finish that builds on the surface of the wood. Shellac is widely considered one of the clearest finishes, so it allows to show through all the marvelous character and figure in wood. 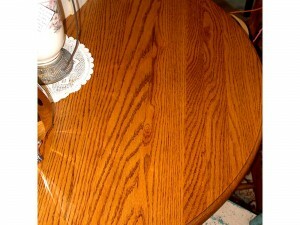 Today’s dewaxed shellac is more resistant to water marks than the shellac of the 1800′s and 1900′s. 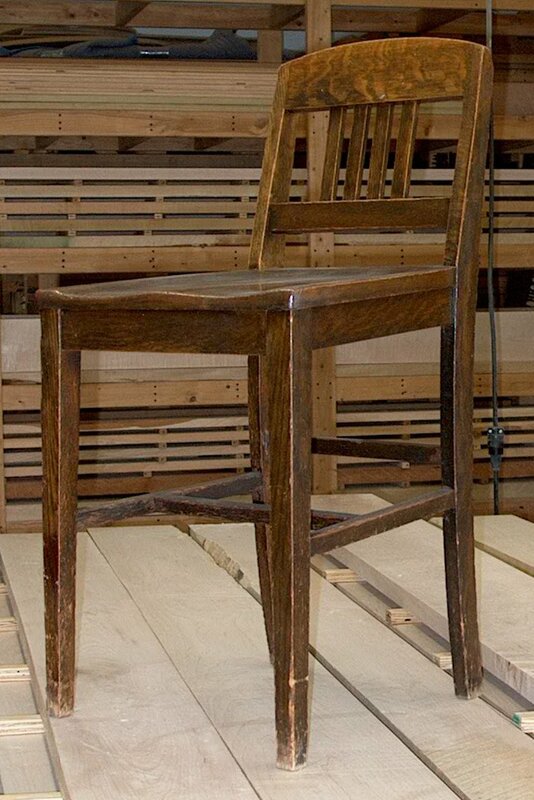 If the finish becomes worn in spots, in about a day, an experienced finisher can pad fresh shellac over the existing, and chips can be invisibly filled in with fresh shellac. 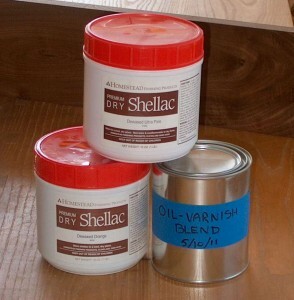 An oil-varnish blend is commonly equal parts varnish, boiled linseed oil and mineral spirits. The oil component wonderfully warms wood and sometimes gives an almost three dimensional appearance to curl and other figure. The first coat soaks into the wood, following coats add protection wthout building a noticeable film or shine. Three or four thin coats offer an unexpected level of resistance to water marks without eliminating the marvelous tactile sensation of wood surfaces. 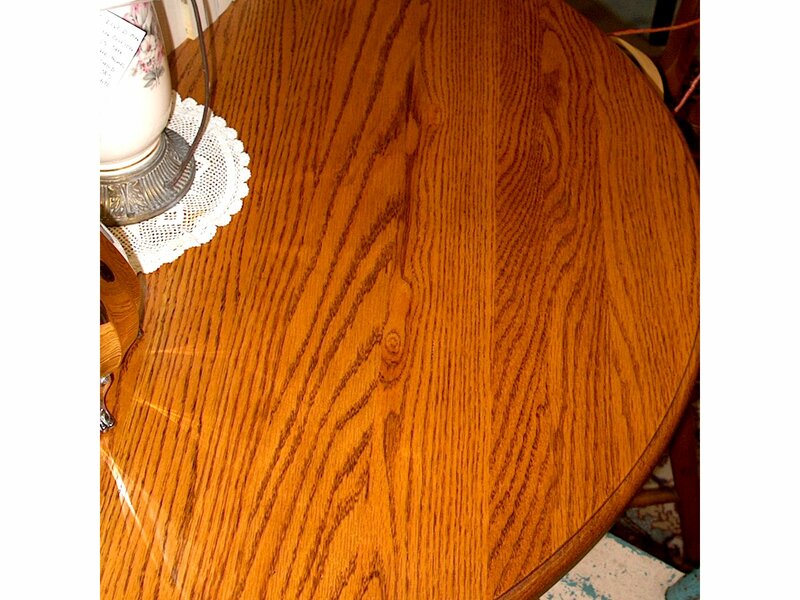 Unlike shellac, scratches into the wood cannot be filled up with a fresh application, but the exposed lighter wood will blend into the rest of the surface with another wiped coat. And like shellac, should the surface look a bit aged in areas of higher use another coat can be wiped on the piece to renew the finish. Dewaxed shellac and oil-varnish can be applied with less waste,and there is less likelihood of having to strip a finish (with accompanying hazardous waste). These finishes should be treated with respect and common sense, but need not be feared. And with a renwable finish, furniture perhaps is more likely to kept for decades, developing a wonderful patina with associated family memories.